Has this been a long summer, or what? We just keep bouncing around, neither significantly up, or significantly down. It’s gotten so bad that the major topic of discussion over on the Buy High Sell Higher Forum over the last week has been religion. Yup, religion. What’s next, a long discussion of politics? You know there is nothing going on in the market when we switch to other topics to keep our minds occupied. My biggest fear is that our next topic of discussion will be the merits of the infield fly rule, and we all know there will never be a consensus on that discussion…. 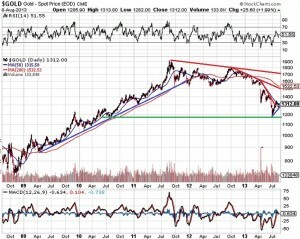 I suspect we will actually have something to talk about over the next few weeks, perhaps even on the gold market. We all know what’s happened in the gold market over the last three years. 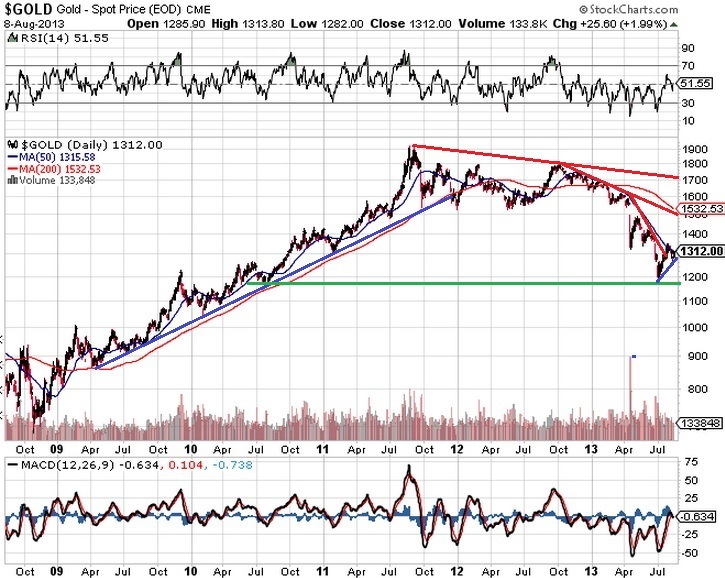 From the peak in the summer of 2011 we have had two down years, finally breaking below $1,200 in the summer of 2013. As this chart, taken at the close of business on Thursday indicates, that $1,200 low is about where we were trading in the summer of 2010. Three lost years. However, gold’s recent bounce, trading over $1,300 on Thursday, and basically unchanged on Friday, may give us some hope. Perhaps the bottom is in. Time will tell. As reported by MetalMeister over on the Buy High Sell Higher Forum, Martin Armstrong is of the view that the markets will keep on rolling higher, because cash has no place else to go. That’s quite possible, since that’s what’s happened over the last two years. The S&P 500 closed at 1,691 on Friday, little changed on the day, and stuck in a trading range for most of the week. That’s not surprising, as we float through summer. A decisive break either way will tell us the future direction. For now, I have no idea. Mr. Armstrong is also of the belief that gold will run, but not until 2015, presumably after we realize the mess we are in. That’s also a plausible scenario. For me, I continue to hold cash and precious metals, I cover when I deem it appropriate, and I wait. I am not currently covered, since precious metal stocks have done well so far this month, although if we have another up day on Monday I may sell some out of the money August contracts, if I can get more than a few pennies for them, so lock in some of the gains. That’s the plan, but again, whether or not that’s the correct plan, only time will tell.